Mobile App: When you download our mobile app to a tablet or iPad at your office, you can use it as a paperless HIPAA-compliant check-in system. The app can digitally automate all necessary forms and signatures, store them into your office system and send appointment reminders to your patients via text message and email. Telemedicine Options: Patients with conditions that make it difficult for them to leave home for doctor’s appointments rely on telemedicine to manage their health. When your practice can offer telemedicine options to your patients, you’ll be able to help more of them in their preferred manner. We’re dedicated to legitimizing the process for booking medical cannabis-related appointments by standardizing the criteria and selection process within our trusted network of licensed physicians. Need evidence MarijuanaDoctors.com can help you? Below are two case studies from practices that have already adopted our services. Since implementing our services, PCC has seen more than three dozen patients a month for medical marijuana reasons, averaging anywhere from three to 10 new appointment requests per day. This has resulted in an ROI of more than 1,000 percent for the practice. And with 18 five-star reviews, it’s safe to say their patients are satisfied, too. Allentown Wellness Center started using our medical cannabis doctor-patient portal in August 2016, 13 months before Pennsylvania began accepting patient registration. The primary physician at this practice is extremely hands-on with all aspects of the patient experience — he even books appointments himself. Over the first 15 months using our medical cannabis portal, AWC received an average of 78 new appointment requests per month. 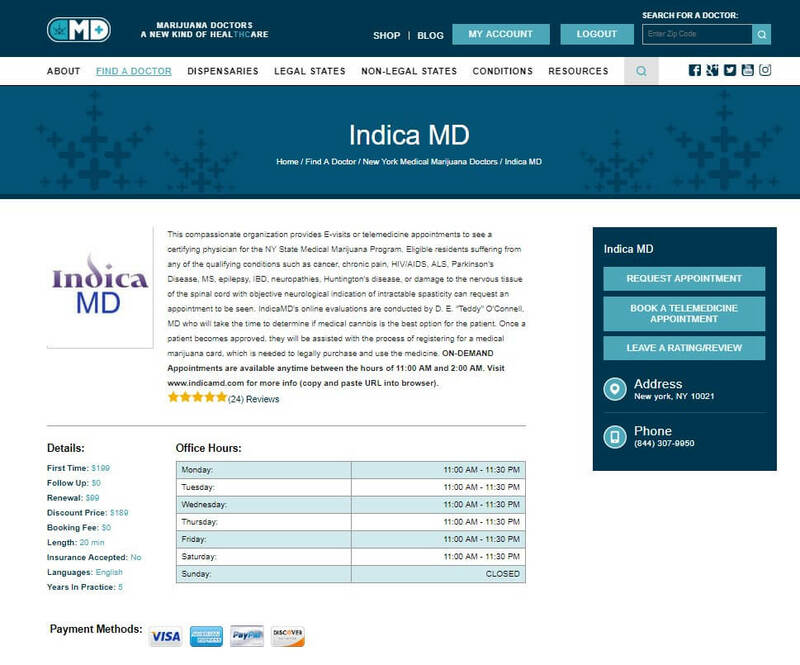 With more than 600 appointments booked since investing in a MarijuanaDoctors.com listing, the practice has seen an ROI of greater than 800 percent.